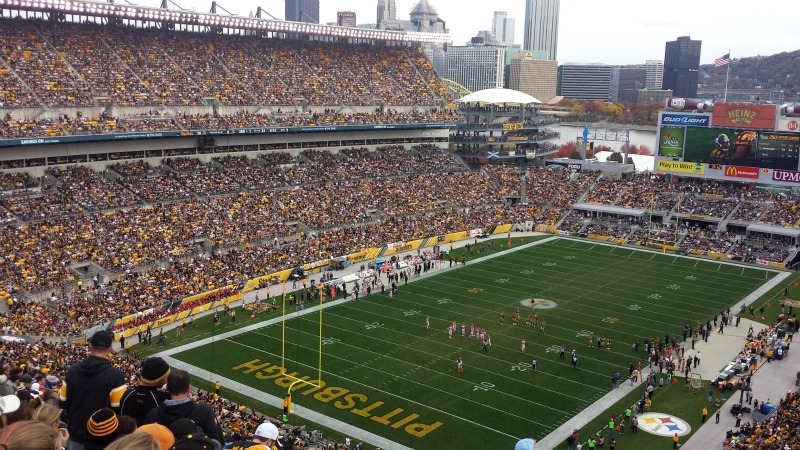 This past week, the Graduate School Association at Carnegie Mellon held a lottery for Steelers tickets at a discounted price. ‘Go to a Steelers Game (while not revealing we’re not rooting for the Steelers)’ has been on our Pittsburgh Must Do list from the moment we knew were moving so no question we added our names. And icing on the cake was these were tickets to the Bengals/Steelers game! Alex and I were bummed to not be picked in the lottery but on Thursday, he got an email that there were some unclaimed tickets still available and that interested students could come to the office at 1 p.m. for a first-come-first-serve arrangement. 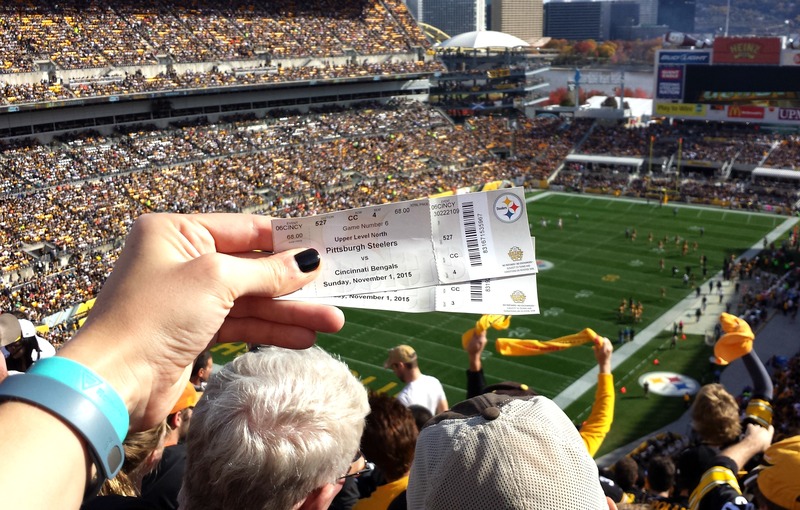 Luckily for Alex, it’s his break week between classes and was already on campus so he hustled over to the office and snagged us a pair of heavily discounted tickets to watch the undefeated Bengals play the Steelers at Heinz field! From Shadyside where we live, we took the bus downtown ($2.50 for a 1 way fare, free for students with ID!) and then the free subway to Heinz Field. Alex knew a couple of other classmates going to the game and we met up with a couple at the Stage AE Tailgate party. This band named Velveeta (yum!) played a bunch of cover songs and I giggled when they broke this one out. Piano Man at a tailgate? We drank cheap beer while chatting with our friends in the hour or so before the game started. 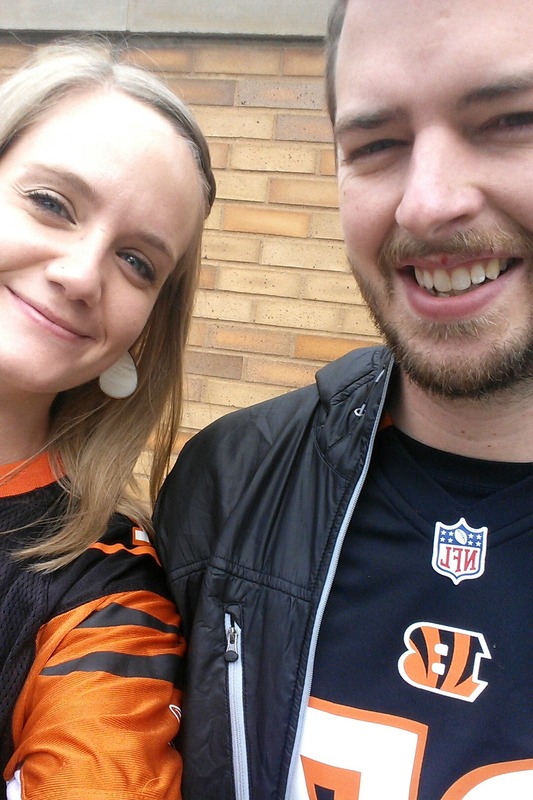 Now, side note: I was a little bit terrified of wearing my Bengals jersey to a Steelers home game. Pittsburgh is CRAZY about the Steelers and I was not too interested in getting heckled because, well, there are thousands of them and only 2 of us Petres. But I (wo)manned up and wore my jersey and Bengal style Toms out the door. On our way downtown, we did get yelled out by drives who slowed down their car, rolled down their window and thought it would be effective to BOOOOOO us but outside of this, I was relieved to find out that Steelers fans pretty much left us alone. Because Steelers football is pretty much a religion here in Pittsburgh, everyone wears Steelers gear like I’ve never seen. I’ve been to NFL games in other cities and was able to find people who were still wearing everyday/casual clothes. Not at Heinz Field. Every single person had on Steelers garb – jerseys, knitted Steelers sweaters, scarves, hats, tshirts, zip up hoodies, necklaces and, of course, the Terrible Towel. Alex and I were so obviously out of place it was hilarious! There were are few other Bengals fans clustered throughout and we all ‘WHODEY’d’ each other in solidarity as we passed one another. The game itself was not very exciting – both teams were playing pretty conservatively and the game was in single digits for much of the time. Our seats were a few rows from the top but pretty good for seeing the whole field and had a nice view of the river behind the stadium. Near the end of the game, the guy sitting behind me got a little aggressive while swinging his Terrible Towel in front of our faces (that’s right, he sat behind us but still managed to swing his towel in front of us) and actually smacked me in the face with it. Obviously, he was intentionally swinging the towel, but to his credit, he was apologetic and said he hadn’t meant to hit me. When the Bengals won (#WHODEY!!! ), Alex and I congratulated ourselves (because we did a lot to affect the outcome) and quietly made our way out of the stadium. Surprisingly, a number of Steeler fans congratulated us too! Of course there were some obnoxious Bengals fans as we exited but, on the whole, everyone was respectful of each other. The Bengals are having a heck of a year (first 7-0 start EVER) and I’m really glad we had the opportunity to cross ‘Go to a Steelers game’ off our list with this game. It’s definitely a bit intimidating to show up in the opposing team’s jersey at Heinz Field but if I had the opportunity to watch the Bengals and Steelers battle it out again, I’d wear my jersey again. And from what I heard around the tailgate and on the bus is that as long as you’re not wearing a Ravens jersey, Steelers fans shouldn’t give you too much crap. Noted! Good for you guys!! Looks like it was a lot of fun! Which one of y’all want to go to the Denver game with me?! ?